MetroLink Expedition? What is a MetroLink Expedition, I asked myself after finding a tweet about it from Dave Grossman, MRH Middle School Digital Learning/Technology Coordinator in Maplewood, MO. It’s an exploration of arts and community learning by 7th graders at the Maplewood-Richmond Heights Middle School, and the faculty and staff invited me to their school to learn more about the program. MRH Middle Principal Bob Dillon wants his students to get out and explore the world. As Principal Bob Dillon and Communication Arts teacher Mike Cassell explained, the expeditionary emphasis of MRH Middle School encourages students to examine and learn from the world around them, including the world outside Maplewood-Richmond Heights area. Once a year, students from MRH Middle School go on their annual MetroLink Expedition to explore the system. The expedition is part of the curriculum’s emphasis on expeditionary learning combined with technology, led by Grossman. Students were asked to get a snapshot of their assigned station, observe the sights and sounds of the neighborhood, compose poetry, record time stops and speeds of trains, and reflect on environmental impact of light rail transit. They were asked to pay particular attention to the public art at the stations. Then the students used digital video and photography to create videos and a collage in the style of the artist Romare Bearden. For the MetroLink Expedition, they shot with Flipcams and produced short videos in iMovie. The students’ videos are available on MRH Middle School’s YouTube channel. The students’ descriptions of the stations and the surrounding communities are honest and observant, the videos picking up signs of neighborhood construction, aging infrastructure, subtle public art installations, and the hustle and bustle of transit riders. 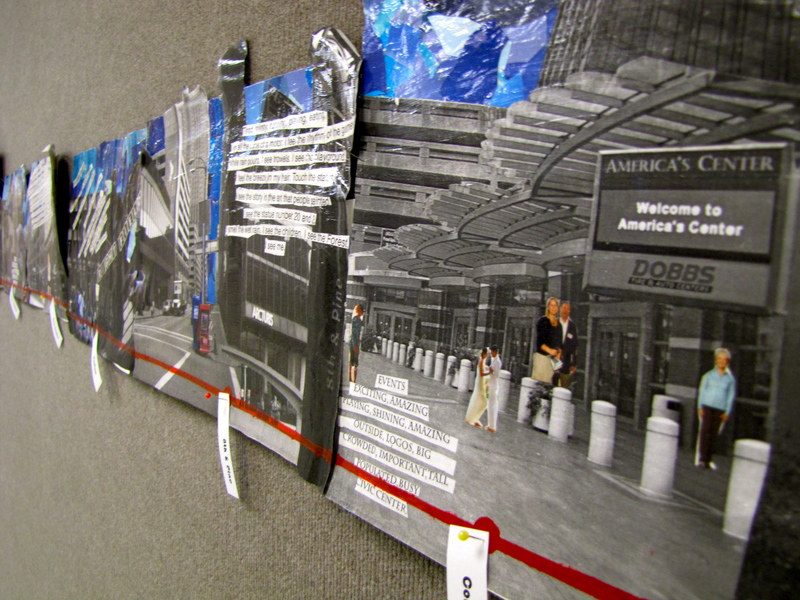 “We wanted them to do an art project in the style of an artist that the students could relate to. 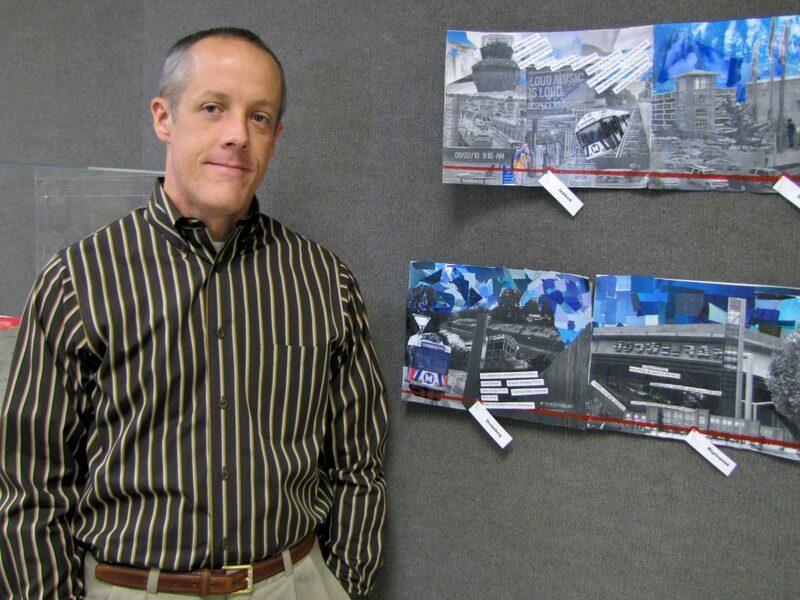 They can relate to Bearden,” explained Art Teacher Kari Schepker-Mueller. 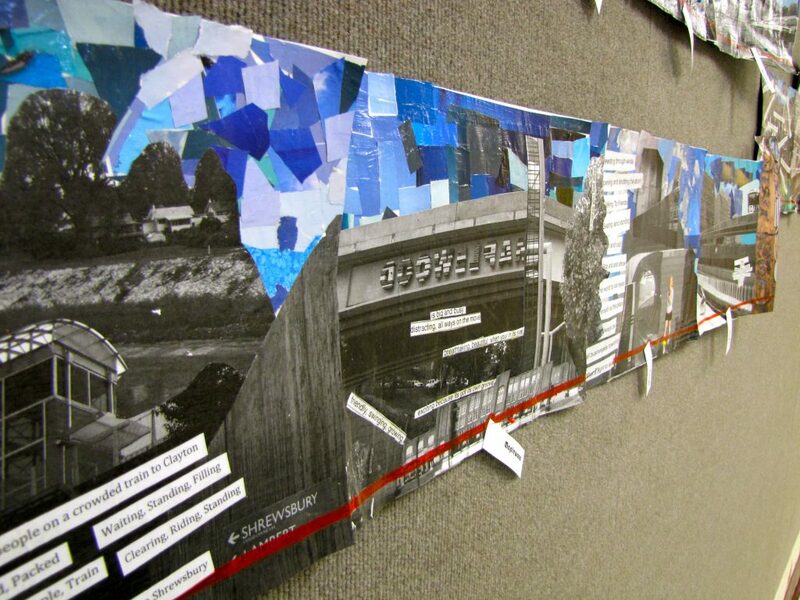 Similar to Bearden’s collage piece, The Block, students imagined a St. Louis “block” by creating a collage of the MetroLink lines. Across the school, every teacher’s classroom is adorned with their name and their alma mater, a reminder to all students about the importance of a college education. In 7th grade, the students take a trip to the Great Smoky Mountain Institute; in 8th grade they venture to Alabama to the Dauphin Island Sea Lab. This year, they happened to learn about a man-made phenomena during their trip to the ocean – the BP oil spill. Students of MRH Middle School will continue to combine interdisciplinary studies and hands-on learning throughout the year with trips to many places in the region. Let’s hope that with the guidance of their teachers and families, the students’ MetroLink Expedition is the start of many explorations in learning and life. For more information on MRH Middle School and their expeditionary curriculum, visit the school’s website. Do you have a suggestion for a story about transit in our community? Email blog@nextstopstl.org. It seems in these times it is unique to see children that have an educated opinion on what is going on in the world around them, rather than being so engrossed in computer games.